What steps did we take to prepare for Hurricane Florence? Secure her in the slip, take down sails, and hope for the best. Read about the exact details here! What's a Bottom Job COST Anyway? Bottom jobs are messy, frustrating, and expensive. Just how expensive are they? See the details of our most recent job for a sample. 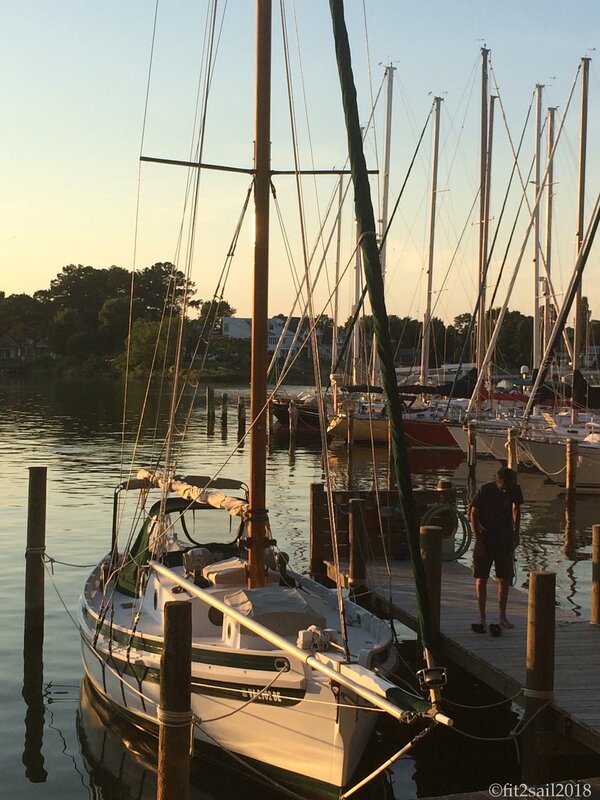 Overbuilt Boats - a Project Update! Jeremy turned off the oscillating cutting tool* and the Shop Vac and looked at me. "There isn't tabbing on the underside too, is there?" I could hear him, barely, over the toilet paper we'd both stuffed into our ears as the best ear protection we could muster on a weekend we thought we'd only be working on the outside of the boat. 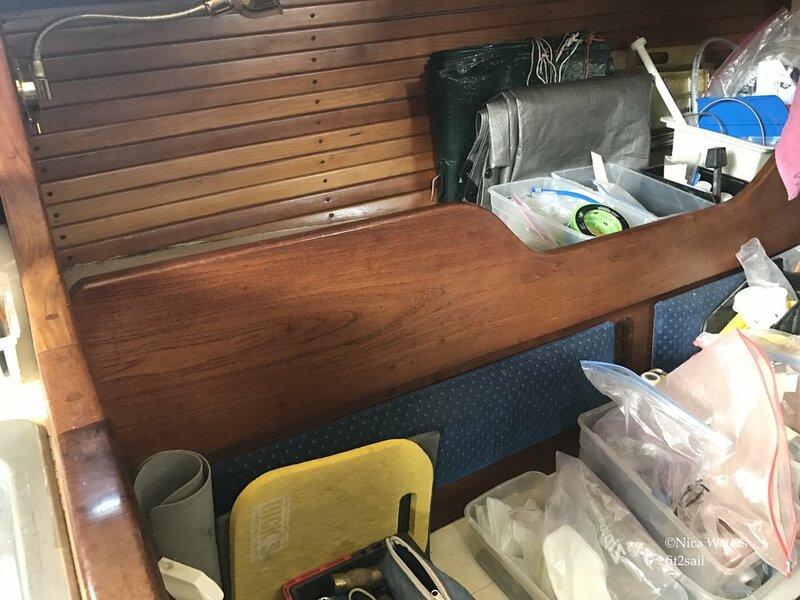 Yes, the shelf that needed to come out as the next step in PROJECT MAIN SALON BUNK was tabbed with multiple layers of fiberglass not only on the top, but also on the bottom. Half inch plywood sandwiched between layers of fiberglass that was close to 1/8 of an inch thick. ON BOTH SIDES. Sheesh. Lovely, sturdy, and facing demolition. The BCC has the reputation of being built like a tank. Lin and Larry Pardey talk about boats being priced by the pound, like a good steak, and this one must be a freaking filet mignon. Burger meat, made into meatballs. The Sam L Morse yard was one where standards were high and the finish quality was superb. 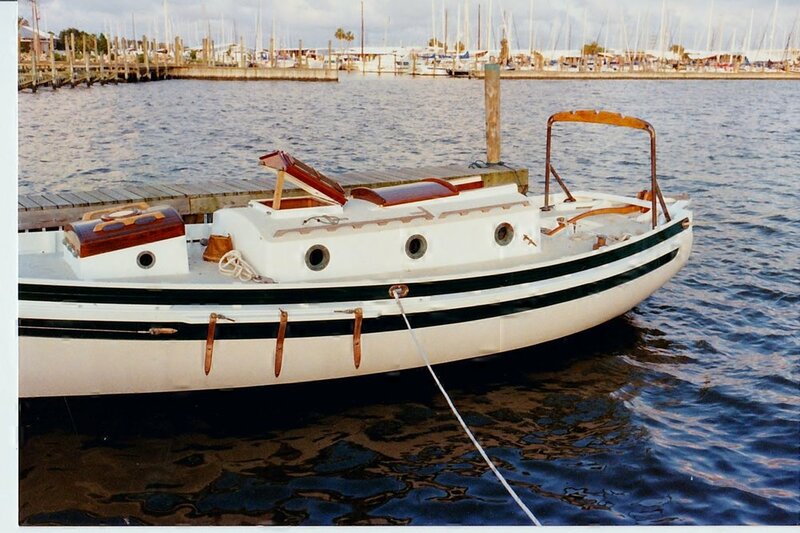 Ours was finished off by a yard in San Diego, I believe – Bill Clark Custom Yachts, if I am remembering right – and I’d have to imagine the finish quality was on par with Sam Morse. Unless it’s common to tab in a shelf with multiple layers of fiberglass tape and roving on BOTH SIDES? Maybe it is. But damn we need to buy stock in an oscillating cutting tool company, or at least the blades. Cutting through fiberglass is hard work! When the original owners had the boat finished off, at least as much as they did that anyway, they probably had no idea anyone would ever rip out the work they put time and money into. They felt that way, I am sure, about the gorgeously finished, mahogany sided cabinet for the stainless steel lobster pot that served as the boat’s first head. When we bought her, mast in a yard somewhere else. I didn't take a pic of the head. The first of many admiring curse words were flung at the builder at that demolition project, I can tell you. And we’re right back at it as we tear out the port side shelf, once the proud base for our single sideband radio and bookshelf as well as kids’ clothing, games, and a whole bunch of spare batteries. An earlier version of work on this space. Note the games, radio, and various amounts of STUFF. I’m not advocating going cheap or easy when you’re constructing any part of a boat. After all, even a lowly bookshelf has to be able to withstand forces and twisting we can only calculate if we’re mathematically (and doomsday) inclined. But it may be worth remembering, as you zealously craft perfection, that someday it's possible you’ll want to tear out whatever it is you are building. Blank slate, ready for the next iteration. Or maybe it’s just better to buy stock in those tools you’ll need to destroy your work now. The Glories of One Inch! We’re in the process of moving our double bunk from the forepeak, where it’s been since we “finalized” the interior in 1993. The initial thought around not putting it in the main salon was that I wanted to have a bunk I didn’t have to make up every night. That space, as you can see in the video, is also where the head is. Where the main tool storage is. Where the extra food is stored. Every single night I had to make up the bunk, reworking sheets and blankets. For a “that bed must look gorgeous before I get into it every night” person like me, this was not what I had thought would be the case. The “factory finished” Bristol Channel Cutters have this ingenious pull out pilot berth on the port side. By day it masquerades as the back to the settee, a book-less bookshelf, if you will. By night, it slides out to form a comfortable double bunk. Call it a Murphy bed for the vertically challenged. This is the "closed" bunk on a friend's boat. Clearly in project mode himself! Our boat, hull number 6, was built before the yard was even offering finished interiors. The original owners (we are owner #3) had it taken to San Diego from Costa Mesa to get her ready to sail; the man we bought her from had never really gotten around to doing the rest of it (other than removing the diesel stove). In 1992, we had basically a clean slate to work with, and putting a v-berth in was high on the priority list. 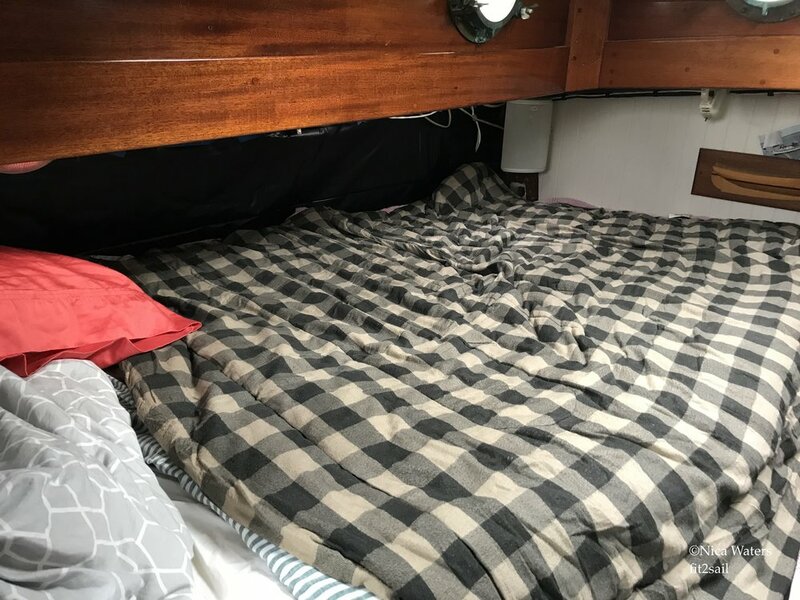 That the head would be under the insert for the bunk was not a great worry; who needs to use the head in the middle of the night? Calypso, as we bought her. Clean slate interior! Ahem, that would be the almost 50 year old me, with her almost 50 year old bladder. No judging. Between that and wanting any visitor to have more head privacy, plus the desire to have a place to shower down below, plus knowing that we’re cruising as a couple this time around (no kids), plus the realization that actually, Lyle Hess (the designer) knew what the heck he was doing when he figured out how the accommodations would work on this boat . . . we’re changing the interior to more closely mirror the factory finish, and we are so excited about it! There are a couple of big things we won’t change. Our galley is to starboard, not port, without the oh-so-smart aspect of the sink bumped out more toward the centerline (for easier drainage!). Our floorboards are about 2 inches higher than on the yard-done boats, giving more room for larger water tanks but minimizing headroom for Jeremy. The work on the bunk has begun in earnest as of this past weekend, when we had a chance to really sit and look and scheme and measure. Boat geometry is complicated in any case; it feels more complicated with a small boat. We need to make the bunk as wide as it can be when it’s pulled out. Allow for as much head room on the outboard (under the side deck) side as possible. Make sure the backrest of the settee isn’t too low for comfort. Ensure that someone sitting on the settee to eat can do so without having to crunch his knees. And make sure there’s bulkhead room for lounging with your back to the bulkhead. All this while making sure the pullout section is supported. That’s a lot of different things to think about in one small space. We’ll mock it up a few different ways before committing to anything, of course, but one thing that stood out as we were measuring and talking and trying things out. Blue tape? Where we could lower the backrest, to gain bunk width. Like literally, an inch will make a huge difference in comfort. It might mean between being able to sit up in bed or relax against the bulkhead – or not. It might mean the difference between a comfortable backrest while sitting or a contortionist’s nightmare while eating. Can we find enough inches to make this tenable? It’s incredible to be thinking in terms of inches. When so much of my life as a landlubber is consumed with more more more, when we talk about faster internet and acres of land and how much MORE can we have, there is something so satisfying in focusing on where to find one more inch of space. It’s precision. Priorities. Looking and thinking outside of the box. Careful attention to detail. And a certainty that it can all work beautifully well together. Where can you find your inches?